It’s important for young girls to have a safe haven that she can escape to when the world gets too much for her and often, this turns out to be her bedroom, which is why you should ensure that it is decorated according to her liking. A girl’s bedroom should be her sanctuary but also reflect her own unique personality so if you are stumped for ideas, read on to get inspired. 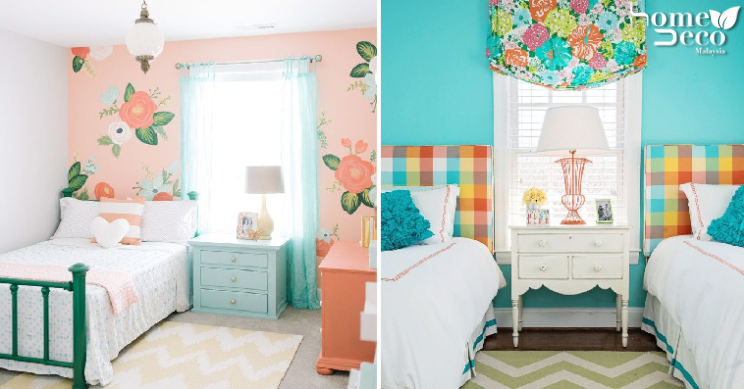 This pretty bedroom is really charming and suitable for girls of almost any age. In here, you can bet that she will have sweet dreams at night with all the gorgeous pastel colours brightening up the room. The floral wallpaper is a nice touch but keep it on one wall only so that it doesn’t look too busy. This one is for the little princess in your life, who has dreams of being the fairytale character with the happy ending as this style will surely please her. The canopy bed with the gauzy fabric adds a nice touch while the pale pink used in the room complements it nicely and isn’t too overpowering. Who says that blue is just for the boys? Break these outdated stereotypes and use both blue and pink to create the bedroom of her dreams for your little girl. A cosy four-poster bed is great for drifting off into slumberland while the whimsical wallpaper behind that combines both navy and pink is a rather stylish touch. Play around with some cheerful patterns that exude positive energy especially when used with such happy colours like this. The mixture of checks, chevron and floral complement each other well and it doesn’t look too busy as well as there are a lot of solid space between each pattern that makes it look neat. If your girl prefers a more dark and moody kind of bedroom, allow her to express herself but also make sure to keep it positive. You can incorporate a few bright colours to brighten up the black walls while ensuring that the windows let in lost of natural light.